Coming off their victory in the previous Bro Bowl, the NFC continued its winning streak over the AFC, beating their rivals 27-21. 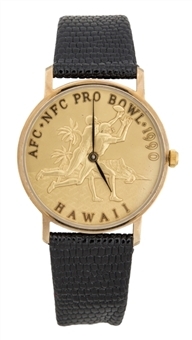 Bears defensive leader Mike Singletary was given this commemorative watch for his 8th consecutive Pro Bowl appearance. The watch face depicts two players reaching for a pass in front of palm trees and ocean landscape with “AFC•NFC PRO BOWL 1990 HAWAII” in gold. The Swiss-made watch has a black leather band with a gold colored buckle and its mechanics do not appear to be in working order. The watch shows good use with visible wear on both the front case and backside. The band displays good use with surface abrasions and indentations from being worn. 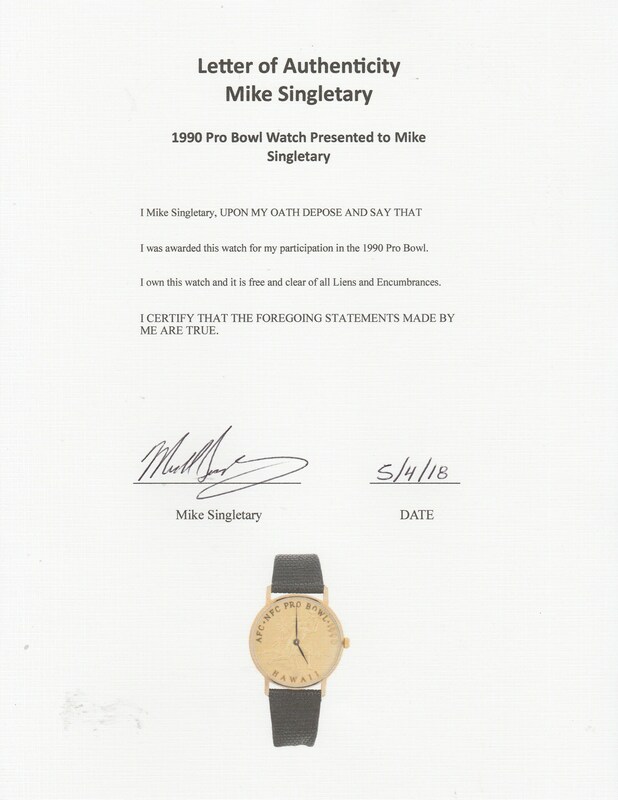 The watch comes with a signed LOA from Mike Singletary.